Registration for food vendors at Kirkland Summerfest 2019 is now closed! Food vendors who apply will be added to our waitlist. You agree to stay open for AT LEAST the hours specified. You are welcome to stay open later on Friday and Saturday if you would like. All sales must end at 6 PM on Sunday to allow for load out procedure. There is no commission on sales. 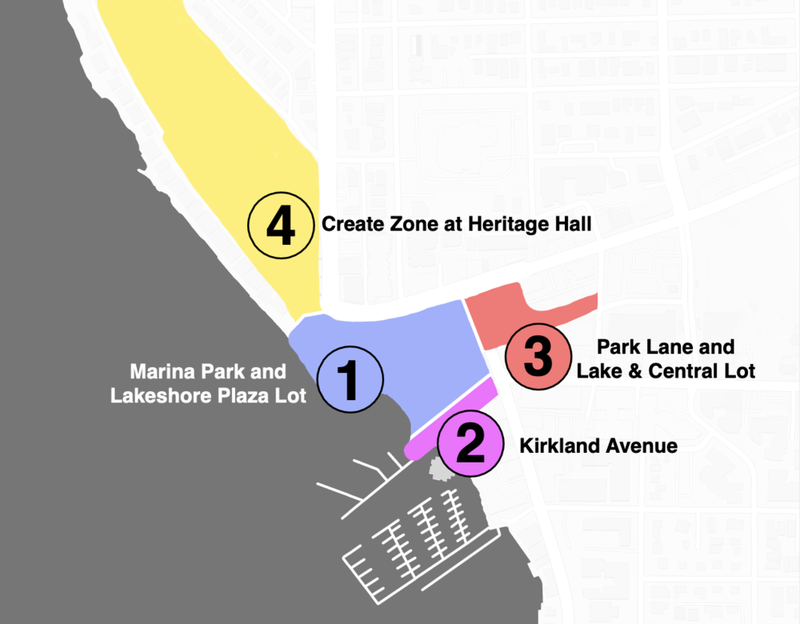 Kirkland’s largest Music and Arts Festival is returning for its 8th year, located in beautiful downtown Kirkland through our picturesque lanes and parks. The festival provides an opportunity to serve to 40,000+ people who are eager to bring enjoy hot days, good music, great food and cold beer. The deadline for submissions is April 8th, 2019. You may request a specific spot, but this placement is not guaranteed. We do our best to accommodate requests, but the layout has shifted slightly, and your original location may not be available. What is the load-in/load-out process and must I line up? The load-in and load-out processes are created to help the vendors load/unload efficiently and easily. There will be a packet emailed the week before the event, stating exactly when each vendor should arrive and line up. It is crucial that all participants adhere to the specifics of the load-in/load-out schedule in order to assure an orderly process. Anybody who misses their scheduled time will need to hand cart their equipment to their booth space. Parking has typically been very limited. No. Each tented food vendor must provide their own 10x10 or 10x20 tent and four or six 25 lbs tent weights (one on each tent leg). We recommend having tent walls for closing hours, as well. We have recommendations for purchasing tents and weights on our website. Remember, it is a minimum requirement of 25 lbs per tent leg. Food vendors may only sell food listed on their application. Vendors must have a valid and current UBI and pay state sales tax. Food Vendors must have a valid license with King County Health and have staff members with valid Food Handlers cards on site. Food Vendors must be open for the entire duration of Festival Hours. Food Vendors agree to have their booth staffed at all times. Food Vendors agree to comply with all city regulations, including the plastic bag ban and tent weight requirements. Food Vendors agree to booth set-up within boundaries of the footprint agreed upon, portable booth collateral may not extend beyond booth boundaries, and aisle-ways must be kept clear at all times. This includes awnings, overhangs, and counters. Food Vendors are to comply with all regulations and comply with food service standards. All areas must be kept free of waste, and garbage disposed of in the dumpsters in the Auxiliary Lot, as indicated by Chump Change Productions Staff. Chump Change Productions reserves the right to remove any vendor for disregard of the written rules/regulations or for disruptive/abusive behavior. All booth assignments are created by Chump Change Productions. There will be a limited number of corner booths available, for an upcharge. Overnight security is present roaming the grounds, but not overseeing any specific booths/areas. All booths are outdoors. Chump Change Productions will provide a 3 compartment sink and food service bathroom, as in accordance with King County Health Regulations. Electricity is available ONLY by contacting Hollywood Lights. Please see www.kirklandsummerfest.com for additional information. All vendors must supply their own booth materials including canopy, tables, racks, chairs, and tent weights. Final booth layout and assignments will be included in the Load In Packet. All Vendors are responsible for all waste in their space. There will be designated “Garbage Drop Zones” in each area and event staff will collect waste from there. All booths, vehicles, and Vendor debris must be removed from the Festival grounds by 8pm Sunday, July 28th. If booth space area is not left clean at the end of the Festival, the Vendor will be charged a $100 Booth Space Clean-Up Fee. Food Vendors: All grease must be properly disposed of. We will have grease receptacles on site. Failure to dispose of grease properly will incur fines from the city starting at $600+. There will be a 3 compartment sink on site to be shared by all food vendors, please respect the space and clean up after yourself. The festival will not refund a vendor for failure of a health inspection. Chump Change Productions does not refund vendors shut down by King County Health Department. It is the vendor's responsibility to ensure good service practices. Kirkland Summerfest enacts a Force Majeure Clause where no party shall be liable for any failure to perform its obligations where such failure is a result of Acts of Nature (including fire, flood, earthquake, storm, hurricane, or other natural disaster), Acts of God, Acts of War, dispute strike, lockout or interruption or failure of electricity or telephone service and no other party will have a right to terminate this agreement in such circumstances once this contract is signed by both parties. Vendor is required to follow all rules and regulations set forth by all event, city, state, and national law making organizations. Responsibility to perform in compliance is solely owned by the Vendor and noncompliance does not void above contract or Vendor fee. Applicant agrees to protect, indemnify, and hold harmless Chump Change Productions, The City of Kirkland, and the Kirkland Downtown Association, their officers, employees, supervisors, and representatives from any and all losses, liabilities, damages, injuries, or rights of action directly or indirectly growing out of the use of the premises covered by this agreement. We highly recommend all artists have insurance to protect themselves against losses or damages. Kirkland Summerfest is under the direction and supervision of Chump Change Productions. I/We hereby release and forever discharge Chump Change Productions, City of Kirkland, Kirkland Downtown Association, all sponsoring organizations, their directors, officers, employees, agents and volunteers from any responsibility, personal liability, claims, loss or damage arising out of or in conjunction with my/our participation in the Kirkland Summerfest. Kirkland Summerfest will not be responsible for any injury sustained by exhibitors or in space designated for exhibits. Furthermore, I/We understand that I/We store my/our artwork at my/our own risk. Applicant agrees to abide by all rules set forth herein. Applicant agrees that photos submitted are representative of work to be exhibited and Kirkland Summerfest reserves the right, in its sole discretion, to advise applicant of any work that does not meet the standards set forth, and applicant agrees that such work will be immediately removed upon request by Kirkland Summerfest officials. Failure to remove such work or abide by other rules set forth may result in applicant's removal from the Kirkland Summerfest, and/or applicant being prohibited from future participation in Chump Change Productions Events. If accepted into Kirkland Summerfest, applicant agrees to obtain a UBI# from the WA State Department of Revenue. If accepted, applicant agrees to give permission to Chump Change Productions to use their artwork images in its internal publications and for Chump Change Productions publicity in external print media, TV and radio. Apply on or before March 31, 2019 and receive a 10% discount on your booth fee!